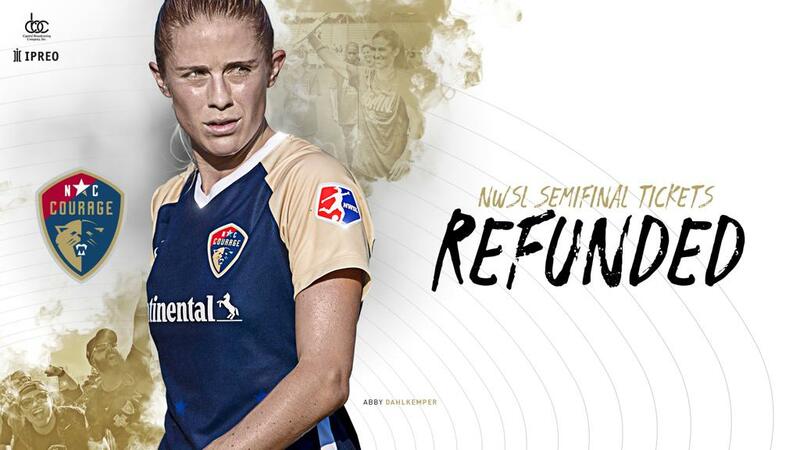 CARY, N.C. (September 17, 2018) –The North Carolina Courage have announced that tickets for the NWSL Semifinal home match against the Chicago Red Stars, previously scheduled for Sunday, Sept. 16 at 3 p.m., will be refunded. All refunds are currently being processed. Despite the club’s best efforts to host a sold-out playoff game in front of its home fans, uncertainty surrounding the forecast of Hurricane Florence forced the game to be rescheduled and relocated. The match will take place on Tuesday, Sept. 18 at 9 p.m. ET at Providence Park in Portland, Ore., and the game will be broadcast on ESPNews. The NC Courage supporters’ groups are planning watch parties and all fans are encouraged to attend and support the Courage. Fans are also encouraged to consider donating to relief efforts to help victims impacted by Hurricane Florence. Click here to donate. Additionally, your support of North Carolina Football Club is greatly appreciated. There are still a few more chances to see meaningful games played at Sahlen’s Stadium at WakeMed Soccer Park this fall. North Carolina FC is firmly in the playoff hunt and has two more home games on the schedule where large crowds are anticipated. NCFC will host regional rival Richmond Kickers on Saturday, Sept. 29 at 7 p.m. and close out the regular season against New York Red Bulls II on Saturday, Oct. 6 at 7 p.m. Tickets for both games are available here. The United States Women’s National Team is coming to Cary for the 2018 Concacaf Championships from October 4-10. Mexico, Panama, and Trinidad and Tobago were drawn into Group A and will face the USWNT. Click here to purchase tickets. For questions regarding tickets and refunds, please contact the Coastal Credit Union Box Office at 919-459-8144.